Sheriff’s deputies interrupt demonstration on Santa Monica Boulevard at Westbourne by transgender people at LA Pride parade. The 46th annual LA Pride parade made its way down Santa Monica Boulevard today despite some real and feared disruptions. The feared obstacle was a report from the Santa Monica police that they had arrested a man on Sunday morning who was planning to attend the West Hollywood event and whose car was loaded with three automatic rifles and a container of explosive material. That news was especially troubling given the massacre of 50 gay people in a nightclub in Orlando, Fla., early Sunday morning by a gunman who professed his support for ISIS, the Islamic terrorist group. The arrest prompted a major increase in security by the L.A. County Sheriff’s Department, which provides public safety services to WeHo. In addition to more deputies on the street, other security measures included bag checks at the entry to the Pride festival in West Hollywood Park and some local bars. Because of those checks people waiting to enter the festival event were lined up along Santa Monica Boulevard from its intersection with San Vicente to its intersection with Robertson Boulevard. 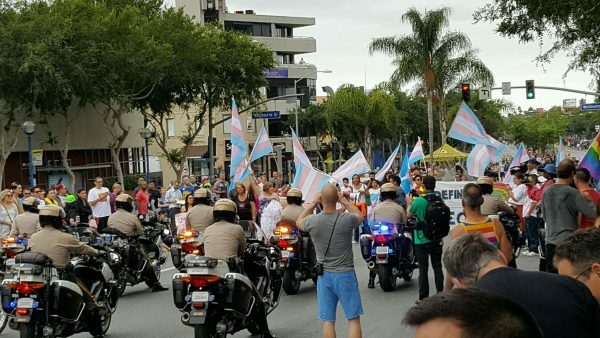 Another brief interruption occurred at Santa Monica Boulevard’s intersection with Westbourne Avenue when a group of transgender activists tried to stop the parade. Members of the group demanded more awareness of transgender issues, a subject raised weeks ago when members of the community learned that Christopher Street West, organizer of the Pride event, had decided to reduce its focus on transgender people at the Pride festival and turn it into a music festival aimed at young people. People on the scene told WEHOville that sheriff’s deputies interrupted the protest so the parade could continue. NOTE: An earlier version of this story said that Nir Zilberman was arrested for his activity adjacent to a parade float. In fact Zilberman was not arrested. He was removed by deputies from the parade route. The story has been updated to reflect that. LA Pride festival attendees go through a screening device and have bags and purses checked. 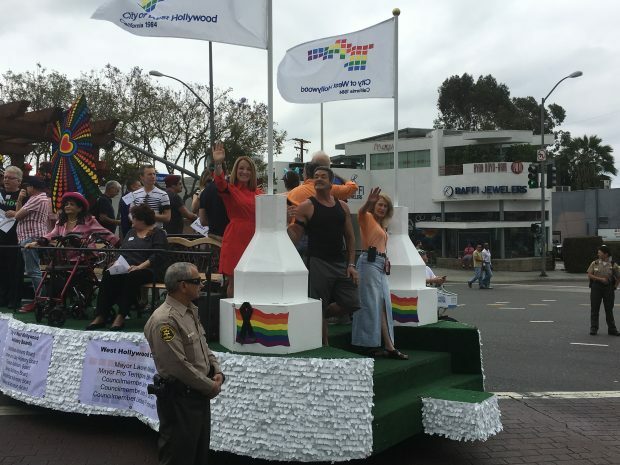 From left, City Councilmembers Lindsey Horvath (in red) and John Duran (in black tank top) and Mayor Lauren Meister (in orange blouse) on WeHo Commission float in LA Pride parade. Councilmember John Heilman is facing the other way behind Duran. Few things you forgot to write i was wearing the PINK TRIANGLE on my concentration camp victim outfit to show what’s happened in ORLANDO is the same, dead LGBTQI are DEAD LGBTQI. Steve Martin and few of my friends, was there when i asked young LGBTQI, what the PINK TRIANGLE mean? NON of them knew. you can confirm this with Steve Martin, long time WEHO activist. YES, I DO STAND STRONG, What happened in ORLANDO, it’s what happening in ISRAEL 24/7. Shame that in WEHO just few hours after The biggest tragedy that happened to our LGBTQ community in America history. we keep playing fun music, dancing in the streets when we lost 49 LGBTQI people to hate. 10 min of talking about it ??? yes , in a normal city, the parade should go on, but the “tone” of the music, the energy should be about those we just die, not about make-up, naked bodies, people wearing fake crown, drunks and drugs. The only people, all remember after sep 11. 2001 when AMERICA lost 2997 people was the Palestinians. the rest of the country was in shock. crying, loving and helping each other. It is “sick” that we as LGBTQI are our own enemies and our leaders and CSW kept the commitment to “MAKING MONEY”. i did not stop the parade not even for 1 second. Like i say few years ago, whats happened in WWII it’s start to happening to us, and the world is silent. just like RUSSIA winter Olympic or our brothers and sisters that get killed in the middle east for being gay. What you forgot to write, I’m the only LGBT friendly store that closed our store after the sheriffs ask me to go home. MONEY DOES NOT BUY ME. yes we closed on the biggest day where i could make a lot of money, i was closed. FOR SURE LA PRIDE WAS NOT MY PRIDE. BE SAFE WEHO, IT’S HAPPENED IN ORLANDO, IT CAN HAPPAN TO US. Half the time I have no idea what Zilberman is ranting about at the City council meetings. I was wondering, scared, what was holding up the parade for ten to fifteen minutes. It looked as if the festival might be fun but I was not going to wait in that long line for two hours just to get in. I wonder how many others did the same. Perhaps more than one entrance should have been provided like at Long beach Gay Pride which I have found to be more fun. good for him for calling out what is wrong with west Hollywood since no one else has had the courage to do so. Zilberman clearly needs his head examined. We’ve watched his stunts and rants for how long now? The passion he has for his causes are blurred by his far-out antics, so he isn’t getting any message across at all.